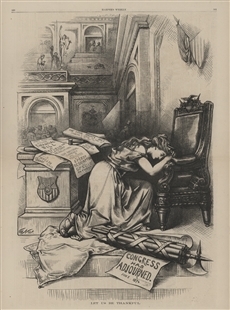 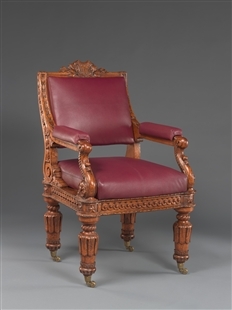 The New York furniture firm of Bembe and Kimbel was awarded a contract in the summer of 1857 to produce 131 chairs for the House of Representatives based on the design of Thomas Ustick Walter, the Architect of the Capitol. 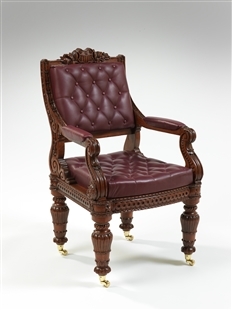 In addition to a December 1857 completion date, specifications called for the chairs to be hand-carved oak and to accommodate two seats (one covered in dark red goat-skin, the other made of cane). 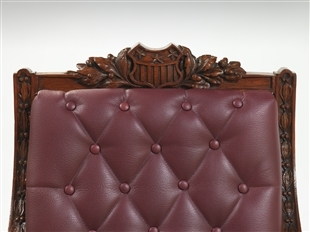 It was a tall order by the Capitol to request a total of 262 chairs needed in five months time, so the Desk Manufacturing Company of Philadelphia was employed in September of 1857 to share half the work load.